Osgood-Schlatter Disease is a common cause of knee pain in young adolescents. It can cause a painful bump just below the knee (Figure 1). It is a traction apophysitis of the tibial tubercle resulting from repetitive microtrauma. This overuse syndrome causes inflammation of the insertion of the patellar tendon on the tibial tubercle (Figure 2). It is more common in boys between the ages of 12 to 15 years and is bilateral in about 20% of the cases. Sports aggravate the condition as in jumpers, sprinters and soccer players. 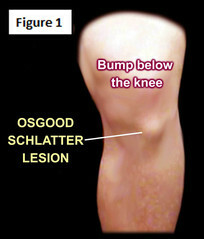 Symptoms of Osgood-Schlatter Disease occur during growth spurts. These include pain, swelling and tenderness localized over the tubercle on the anterior aspect of the knee. The tibial tubercle may appear enlarged. The pain is increased with physical activity and sports. Children presenting with Osgood-Schlatter Disease should reduce their level of activity until it heals. A short period of limited activity may be sufficient. Knee immobilizer, physiotherapy along with hamstring and quadriceps stretching will be helpful. The condition may become chronic and cause residual pain, swelling and joint tenderness. In this situation, an x-ray should be obtained, check the lateral x-ray for fragmentation, irregularity, and an ossicle of the tibial tubercle. A separate ossicle over the tubercle may be present and an operation of the ossicle could be needed. Osgood-Schlatter Disease is a self-limiting disease. It occurs with an increased demand on the immature skeleton and it is resolved when the patient stops growing, around age 14 for girls and around age 16 for boys. Prominence of the lump may persist.